In the commercial air conditioning equipment business, we are promoting installations of the GHP XAIR II gas heat pump air conditioning system, which reduces annual energy consumption compared to conventional systems, and natural chillers, which use natural refrigerants. We also proactively recommend restaurants and hotels to introduce Suzuchu cool kitchen systems, which lower kitchen heat and reduce environmental impact. Tokyo Gas emphasizes the promotion of the GHP XAIR II series among its gas heat pump (GHP) air conditioners, which save both electricity and energy. The series reduces 20% of annual primary energy consumption, the highest level of efficiency, compared to the previous XAIR, by improving efficiency. This is achieved by slowing down engine rotation during low load operation, which accounts for a significant portion of their running hours. *Energy consumption reductions from the model 15 years ago and XAIR are based on actual performance, while comparisons between the conventional XAIR and XAIR II are based on Tokyo Gas estimates. The Smart Multi is a hybrid air conditioning system jointly developed with Osaka Gas Co., Ltd., Toho Gas Co., Ltd. and Panasonic Corporation and introduced into the market in April 2016. The system boasts the world’s first integration of a GHP and an electric heat pump (EHP) into the same refrigerant line and is optimally operated by remote control. Joining Panasonic, Aisin Seiki Co., Ltd., Daikin Industries, Ltd. and Yanmar Energy System Co., Ltd. began sales of the system in April 2017. The ENESINFO is our originally developed service to ensure optimal operation of the Smart Multi by remote control. 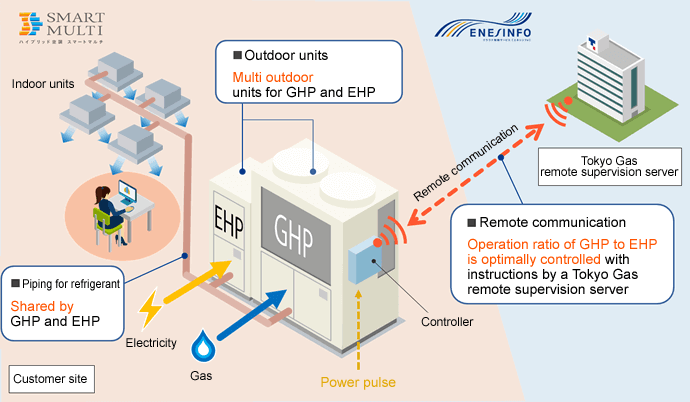 The service effectively balances GHP and EHP operation to reduce energy costs, confirming the status of their operation, energy demand and supply situations and energy prices, which vary by season and time of day. It helps to save energy and reduce CO2 emissions by adjusting the operation ratio of the GHP to the EHP to minimize energy consumption and CO2 emissions in accordance with the customer’s pattern of system use. Looking ahead, we intend to adapt the service as we anticipate changes in power demand and supply and in electricity prices associated with such factors as the increasing use of solar and wind power and other renewable energy as well as the liberalized retail electricity market. We will also respond to requests for saving electricity in the face of a tight demand and supply balance as our contribution to society as a whole. *Smart Multi and ENESINFO are registered trademarks of Tokyo Gas Co., Ltd. In our support for renewable energy use, and for commercial use, we propose a solar cooling system that applies solar thermal energy for air conditioning. This is in addition to the SOLAMO system, which combines solar heating with an Eco-Joes highly efficient water heater. Natural chillers cool air inside rooms by producing cold water in a cycle of water evaporation, absorption, recovery and condensation. The system uses water as a refrigerant and a lithium bromide*1 water solution as an absorbent that does not include fluorocarbons. *1 An absorbent absorbs water, and a lithium bromide water solution exhibits the properties of saltwater. Natural chillers can effectively use renewable energy such as solar heat and low-temperature untapped energy sources such as sewage water, river water, seawater and groundwater as well as exhaust heat from combined heat and power (CHP) systems*2, thereby achieving additional reductions in energy use and CO2 emissions. Moreover, an unstable renewable energy supply can deliver stable performance backed up by city gas. The latest green models*3 boast a higher efficiency than conventional ones. Using these models as replacements ensures significant cuts in energy use and CO2 emissions. *3 Green models are the most eco-friendly and reliable gas-using natural chillers and natural chillers that use waste hot water from CHP systems, selected by Tokyo Gas, Co., Ltd., Osaka Gas Co., Ltd. and Toho Gas Co., Ltd. Combining natural chillers with CHP systems allows for the effective use of exhaust heat and reduces gas consumption, which leads to further energy savings. We recommend equipment that reduces kitchen heat. 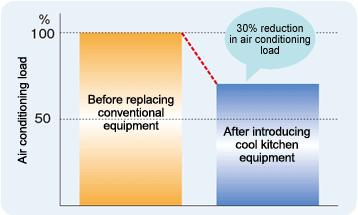 The so-called “cool kitchen equipment” reduces air conditioning load by 30%* compared to conventional kitchen equipment, and this helps to improve the kitchen environment while saving energy and cutting CO2 emissions. The industrial sector dramatically reduces CO2 emissions by switching away from the use of fuels such as oil and LPG to natural gas and installing more efficient industrial burners and furnaces. 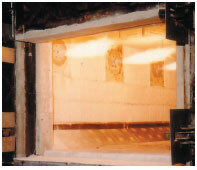 Regenerative burner systems capture heat from exhaust gas into a heat storage unit and use it to preheat an air feed. They boast extremely high combustion efficiency and low nitrogen oxides (NOx) emissions. Also boasting energy savings up to 50%, they have been drawing attention as the ultimate industrial furnaces for reducing CO2 emissions. Switching from fuels such as oil and liquefied petroleum gas (LPG) to natural gas reduces CO2 emissions by about 25%. Emissions can be curbed even more by switching to more efficient equipment and systems and making more sophisticated use of natural gas. CHP systems are distributed energy systems that generate electricity by natural gas-fueled highly efficient engines, turbines or fuel cells and supplies steam or hot water produced with the use of the waste heat from power generation. The systems are eco-friendly, help strengthen energy security in an emergency and contribute to reducing power consumption. CHP systems achieve high energy efficiency because they generate power close to electricity users in distributed generation with no transmission loss and effectively use waste heat from power generation. Using waste heat in centralized power generation is difficult because electricity is transmitted from remote areas and 60% of the generated electricity remains unused. Heat source equipment that uses waste heat is suitable for a wide range of uses, such as production processes at plants, hot water or steam supply at hotels and hospitals, air conditioning, and warming baths or swimming pools. The pursuit of power generation efficiency in research and development allows most CHP systems to achieve an efficiency rate that exceeds the average rate of conventional power generation and supply systems (on the demand side at substations, including transmission loss) and to significantly save energy and reduce CO2 emissions. *1 On a lower heating value (LHV) basis. The heat efficiency and total loss at thermal power plants were calculated on the basis of the operating performance of Japan’s nine major power utilities plus power wholesalers in fiscal 2003 (Subcommittee on Classification Standards for Plants and Other Facilities, September 2005). *2 Efficiency of CHP systems is on an LHV basis using the recommended configuration. *3 Emission factor of the nine power utilities: 0.66 kg-CO2/kWh (average factor for fiscal 2030 in thermal power generation in the government’s Plan for Global Warming Countermeasures announced in May 2016). CHP systems with a total output of 2,074,000 kW (excluding household units) are in operation in our service area. They are increasingly adopted across a wider range of fields, such as small- and medium-scale consumer use beyond residential use, owing mainly to the development of small models with an output of one kW to tens of kW, in addition to models chiefly designed for plants and commercial facilities with large heat loads. 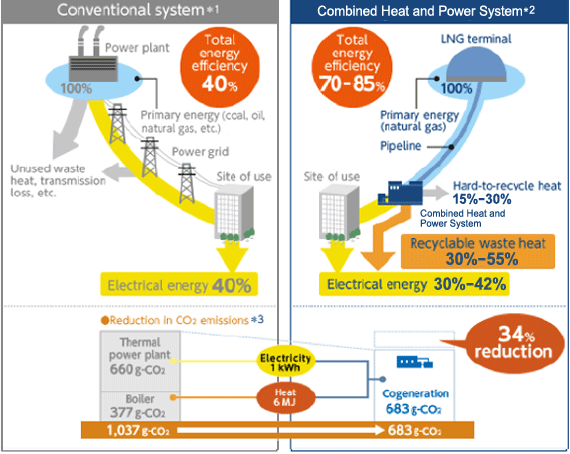 The Tokyo Gas Group strives to solve energy-related issues of customers and promotes efforts to save energy and reduce CO2 emissions. To this end, we provide services to learn how customers use energy and identify the problems they experience, introduce advanced equipment, visualize energy use and provide services to improve equipment operation. We strive to provide one-stop solutions for customer issues related to energy. Concluding package contracts that cover finance, designing and construction work, equipment ownership, energy procurement, maintenance and other matters allows us to address those issues and meet customer needs in order to save energy and cut CO2 emissions so that we can provide an environment in which customers can focus on their business operations. We provide various solutions to plants that not only save energy but also reduce CO2 emissions and costs. 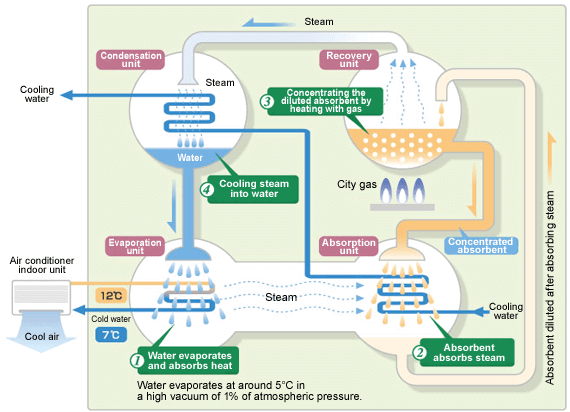 Our TG Miru-Net Service visualizes energy use with online measurement and analyses of equipment in order to save energy, and the Steam fit service, which provides comprehensive, ongoing support for steam systems from design to operation. We meet the needs for saving energy, cutting CO2 emissions and reducing cost with a variety of approaches.